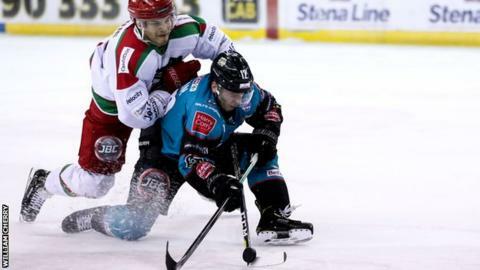 Belfast Giants cut Cardiff Devils' lead at the top of the Elite League table to one point by earning a 4-2 win in the top-two contest at the SSE Arena. Cardiff twice fought back to level with goals from Joey Haddad and Gleason Fournier cancelling out strikes from Dustin Johner and Jordan Smotherman. However, Darcy Murphy punished a defensive error to restore Belfast's lead with seven minutes remaining. Blair Riley's strike with a minute left sealed the Giants' victory. The sides meet again in Belfast on Saturday night when the Giants will have the opportunity to move to the top of the table. After Belfast's Kyle Baun struck the inside of the Devils' post seconds into the contest, Johner did put the Giants ahead as he netted following Murphy's penetrative skate on goal. However, an equaliser soon followed as Layne Ulmer pounced on a rebound off Tyler Beskorowany's pads to set up Haddad to fire home as both sides also successfully killed penalties in the opening period. After a Smotherman shot was edged onto the bar by Bowns five minutes after the restart, David Rutherford then served two for another penalty for a face-off violation on 26 minutes but the Devils failed to exploit their man advantage. Cardiff's Josh Batch was then called for interference on Rutherford and, as tempers flared, three more players sat it out. The Devils' Mike Hedden and Belfast's Josh Roach came to blows with the Giants' captain Blair Riley also penalised after joining the fray. But while the penalty counted continued to mount, the scoreline remained locked at one-all heading into the second interval. The third period saw a crucial five-on-three power play after penalties were called on Charles Linglett (elbowing) and Matthew Myers (tripping) of the Devils. Smotherman, the Giants' newest recruit, restored the lead with a solo effort in the 49th minute just as Linglett returned to the ice. However with Mark Garside serving two minutes for holding, the Devils levelled again as Fournier blasted in from the blue line. However, two defensive errors by the Devils proved to be pivotal. Firstly, Josh Batch turned over possession in front of his own goal and Murphy pounced to make it 3-2 to the Giants. Belfast captain Riley then sealed the win, with a minute to go, after stealing the puck and despatching it past Bowns.